Just in time for your Valentine’s Day cards, the Form-A-Lines Heart Set has been added to the Classic patterns collection. This beautiful set has three patterns: Flower hearts, Heart and roses, Heart lock with key. 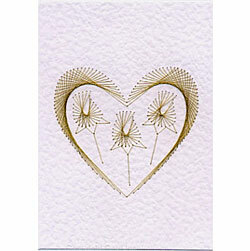 These heart patterns also make gorgeous cards for anniversaries and other special occasions. The patterns are also available individually. This Classics store specialises in out of print patterns from the Form-A-Lines stitching card range. Patterns are supplied as PDF files. Download them to your computer on completion of purchase. That sounds like an interesting suggestion Margaret.